Over the course of ’69-’70, Jimi Hendrix appeared at his most noted live appearances--Live at Woodstock, Live at Berkeley, and Live at the Fillmore East--using a mysterious red Fuzz Face Distortion with white knobs. 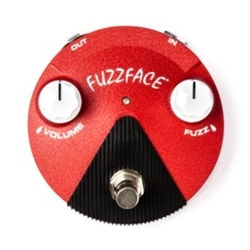 That fuzz box sounded like a completely different animal from any of the other Fuzz Face pedals in Jimi’s arsenal, snarling with a far more aggressive, biting tone. Poring tirelessly over all of the different customized circuit designs Jimi used over the years, our engineers narrowed down this elusive fuzz tone to a version of the Octavio circuit that didn’t have the octave up signal. After making a few tweaks, they nailed it with the Band of Gypsys Fuzz Face Mini Distortion.